charlotte ronson created her spring show around the theme of a parisian in new york city. of the collection, she said, “She’s studious and intellectual, but she likes to have fun. The dresses are sweet, but you can see the body underneath.” the collection featured plenty of pieces with a tomboyish twist, an edgy, girlish breakfast at tiffany’s girl, maybe. shelley burns for color club created an effortlessly cool manicure for the show, featuring delicate polka dots with a nod to parisian subtlety. it’s easy to venture into garishness with polka dots, but i loved the clean, simple look of this manicure. get the look by using color club’s french tip over the whole nail, and then using the duo pen in black for the dots. 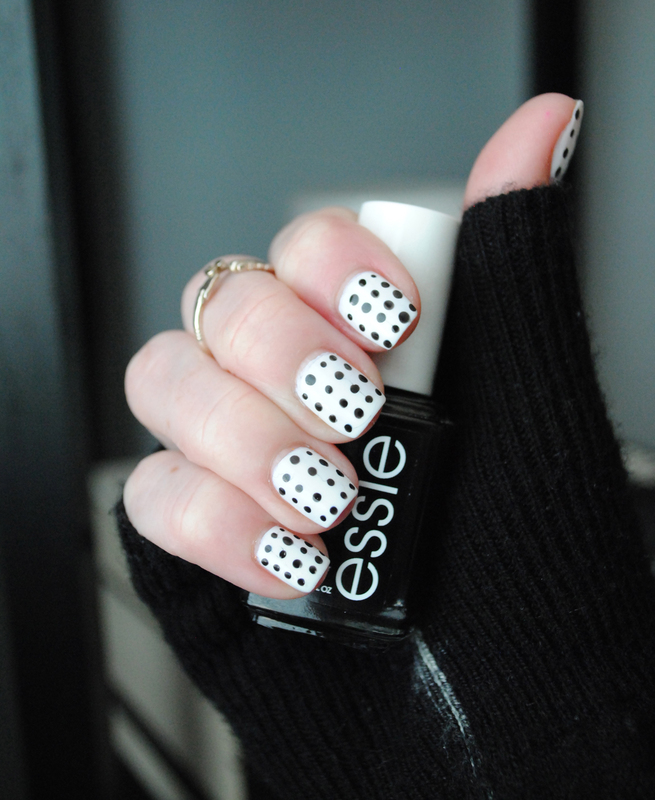 i recreated the look by using chanel eastern light as the base, and essie licorice for the dots, using a dotter tool. make sure to make the dots small and delicate. add a shiny top coat to seal it all in, and you’ve got the look.